If you are anything like me then you just know how frightening it can be when you are confronted with someone much taller, much bigger, much stronger and they are intent on doing you harm. It is a true nightmare scenario! We are all much more likely to be attacked now than we have ever been. Fernando specialises in helping anyone improve their self defense skills. As a Fight Trainer he is in constant demand from MMA Fighters around the Globe. You are in safe hands learning from this Master of the Arts. He has been doing that his entire career. I am going to teach you the EXACT Self Defense moves that we use in BJJ. These techniques have been proven to work both inside and outside of the Cage and are ideal for the smaller person against the larger opponent. Not only will you see me perform these techniques, but afterwards you will see the Worlds No.1 Pressure Point Fighting Expert, Russell Stutely ADD Pressure Points to many of these techniques and variations that will DRAMATICALLY increase the effectiveness yet again. For those BJJ practitioners out there in any doubt, I can personally vouch for the effectiveness of these Pressure Point enhanced techniques. REMEMBER: What Russell will show you is for Self Defense only. You will most likely be banned from competition if you try these on the mat. Russell has been teaching his unique system for over 20 Years all around the World. 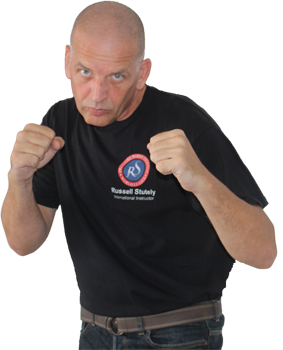 He has helped 1000’s of people just like you, improve their Self Defense skills – virtually overnight. For over 20 Years now, I have been travelling the Globe teaching my systems to Police Forces, Military Units, Martial Artists, Security Officers and to Corporate Bodies. My systems are ”required learning” at nearly 100 Police Academies. Over 20,000 Security Officers per year become Certified in my systems. This is no accident – it is because my systems work and they work damned fast. I have worked with Professional Fighters to increase their speed, timing, distancing, punching power and much more. I have hundreds of rounds with Professional Boxers at the highest levels under my belt. I have had broken ribs, my jaw broke, teeth smashed out and still carried on fighting. I have worked Security in several Countries and have first hand experience of real World violence. I tell you this, not to blow my own trumpet, but to let you know for sure, that you are indeed in the right hands when it comes to getting the right information about defending yourself and your loved ones. 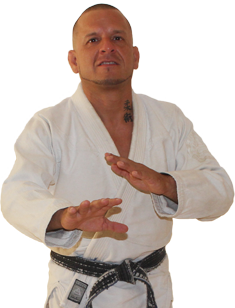 We asked Fernando to show us EXACTLY how Gracie Ju Jitsu would handle some of the most common Self Defense scenarios for the smaller person or the weaker person out there on todays mean streets. As a former Champion and a 3rd Degree Black Belt who is 5ft 3 and under 130 lbs, he KNOWS these problems all too well. THANKFULLY, he also knows HOW to make techniques work against the bigger guy – after all, he has been doing that all of his life! This means you can’t rely on strength and power to get out of situations – you also need technique. Fernando told us, that all of these techniques shown have been used in the Cage, on the street and are EXACTLY what is taught in Gracie BJJ Self Defense. You will see Fernando escape strong and potentially lethal attacks with devastating ease – using the techniques and principles of Gracie BJJ. Learn the "secret stance" that makes you an immovable object. Fernando calls this "holding a plate". Watch as a 6ft, 180lb attacker, is unable to move Fernando even one inch! - Spectacular Stuff! Get them off and walk away or break both of their arms at the same time - the choice is yours. Fernando had to use extreme caution when showing this technique. This is incredible to see. Watch as Fernando shows you how to "swap positions" with your attacker. One second the bad guy is on top ready to smash - and the next, you are! Wow - this is getting juicy now! This one just blew our minds. Watch as Fernando carries on talking whilst various strangles are being applied, just to prove how his methods will help keep you safe. Then he applied the defense - INCREDIBLE! There is so much more information on this action packed DVD Set. Then things got more serious – which is great news for you. Fernando asked us, to get the Worlds leading Pressure Point Fighting Coach, Russell Stutely, to show some variations of these techniques for you. Fernando and Russell both train together at the same Gym, in Phnom Penh Cambodia, where they met up many Months ago. They have spent many Months analysing each others training methods and learning from each other. Which is something they have both kept quiet about – till Fernando persuaded Russell to be Uke for this DVD Set. Well, when we say persuaded, we mean asked! Of course Russell jumped at the chance to help his Sensei. During the filming they would often be seen going through evil techniques off camera and discussing if they should be shown or not! We were aware of this and after filming with Fernando, we asked for his permission to request some techniques from his BJJ Student, Russell. We were delighted when Fernando said, no problem… and so a few days later at the other end of the Huge Prokout Gym, we filmed live during the day with Russell. We want to make one thing absolutely clear here – The filming took place at Prokout Gym, in the heart of Phnom Penh, Cambodia. Anyone who has visited Asia, will tell you this fact – nowhere, ever, will you find a place that is actually quiet for more than 2 seconds! So, you will occassionally hear the “sounds of Asia” as they say, during this shoot. It in no way, detracts from what you can see and hear – all is crystal clear – but here at Gracie BJJ – we are always 100% up front and honest… part of the tenets of BJJ! This simple shift of the body will DOUBLE the power of your Guillotine. You MUST train this lightly for the safety of your training partner. This one left us dumbfounded. How a simple little twist turns a ''Standing Kimura" into a double break on the same arm! Watch as a seasoned Thai Fighter is in agony as Russell "gently" applies a Pressure Point. Then imagine the pain if it was struck with full power. Russell showed a ton of stuff that utilises "Atemi" within your BJJ and Self Defense. This is for serious Self Defense situations only - it is banned from competition. We want to make sure that you can watch this material immediately, no matter the device you are ordering from. With that in mind, the Digital downloads are optimised to play on all of the above devices. REMEMBER: You will receive IMMEDIATE Access after purchase. For Illustration purposes only. This is a DIGITAL DOWNLOAD. All 3 DVDs for IMMEDIATE DIGITAL DOWNLOAD, from former World Champion, Fernando Salvador, 3rd Degree BJJ. Learn the EXACT techniques used by Gracie in the Cage and for Self Defense. PLUS - A ton of extras and technique enhancers from Russell Stutely. This remarkable 3 DVD Set was originally bring priced at $397 for Digital Download. You will also receive a FREE Bonus Digital Download courtesy of Russell Stutely. The Pressure Point Defensive Tactics Level 1 Course. This is the EXACT System that is required learning at nearly 100 Police Academies – Usually priced at $197.00 and today it is 100% FREE! REMEMBER: This is for DIGITAL DOWNLOAD ONLY. You will receive IMMEDIATE ACCESS after purchase and have unlimited access to your Downloads. You get all the downloads as above BUT ALSO you receive Beat The Big Guy 3 DVD Set delivered direct to your door with FREE International shipping. Today could be your last chance at this special offer. We do not know exactly when the price will go up to the original price, but it will be soon. Do not take that chance, get started now before it is too late.